The growth in omnichannel shopping is bringing out creative solutions from brands like Staples, which has recently launched an innovative feature for its iPhone app that merges your online and in-store shopping experience. I recently had the opportunity to review this app, so I’ll tell you all about it below, along with some more information about omnichannel shopping. 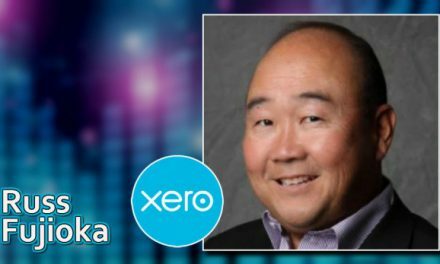 This article was written in partnership with Staples, an office supplies store that is committed to making it easier for businesses of all sizes to find the products and technology they need to succeed. If you’re unfamiliar with the term, omnichannel shopping refers to the growing number of consumers who shop both online and in physical stores, often using a hybrid method to browse and buy the products they need. For example, they may start out by researching products online, then go to a local physical store to make the purchase. Or they may see a product in a physical store but then make the purchase online. They may even choose in-store pickup when checking out online, which brings them back from the online realm to the physical store all over again. Apps that save a customer’s shopping cart so they can access the cart again if they switch devices (for example, if they add something to the cart using their smartphone, it will be there later when they come back to the site using their tablet). In-store associates armed with iPads, allowing them to give shoppers more information about products or to ring up customers on the spot. QR codes in print advertisements or on product packaging that allows a person to scan the code with their phone to visit a special URL that gives them more information. 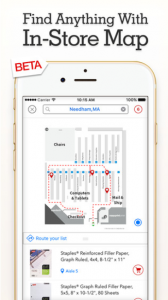 Staples’ iPhone app just got an amazing omnichannel upgrade in its 5.0 update. More specifically, 83 select stores in New Jersey, New York, Massachusetts, and Seattle have been mapped out so you can see a complete map of the inside, allowing you to know exactly where products are and plan your shopping trip accordingly. Search for products within the app to find out if they are available at your local store. Pinpoint the exact location of the products you need, so you know where to find them inside your local Staples store. Plan your route inside the store, so you can find the easiest and most efficient way to grab your items and check out. The majority of Staples shoppers are omnichannel shoppers, which is why Staples created the new functionality. In fact, statistics show that 70 percent of Staples iPhone app users are omnichannel shoppers, making this the perfect update for those who want an easier shopping experience. Fortunately, I live in the New York/New Jersey area where the new functionality has been launched, so I was able to try out the in-store map function. As I mentioned, the function is currently being beta tested for 83 stores in select areas; if you don’t live nearby, hopefully, it will come to your area soon! Check the app before you leave to make sure the product you are looking for is available at your local store. If it isn’t, then at least you haven’t wasted a trip! You can use the app to check availability at other stores nearby, or to make the purchase online instead. If you just walked into the store but aren’t sure where your product is located, just pull out your phone! You’ll avoid wandering around looking lost, and quickly discover where the product is hiding. The in-store map isn’t the only feature of the app either. 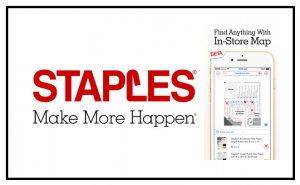 You can also use the Staples iPhone app to find store information (like address, phone number, and store hours), view the latest deals and coupons, search and research products, purchase online-only items, or purchase items online and then pick them up in your local store on the same day. 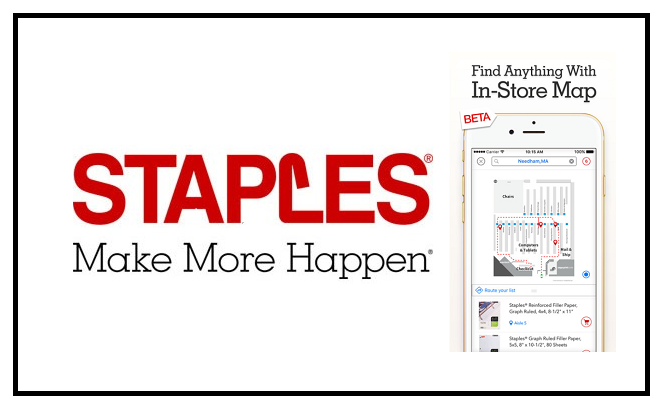 If you ever have to purchase items for your business, whether office supplies, coffee or technology, I recommend downloading the free Staples iPhone app today. Not only is it perfect for omnichannel shoppers, but it’s also great for any business owner who wants an easy, convenient and stress-free shopping experience. Staples is an office supply chain with a 30 year history of helping businesses of all sizes. Staples promises: “We make it easy to make more happen” with more products, more ways to save, & more ways to shop. The Staples App demonstrates the commitment to making it easier to shop by unifying online & in-store shopping. 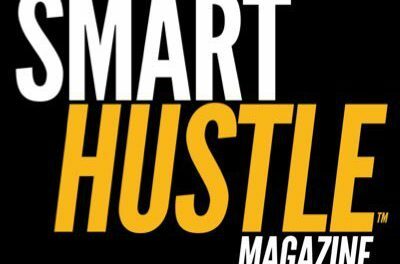 NextSmart Hustle Recap: The Importance of Existing Customers, Surcharging Credit Cards, & More!